Neurologist says that a lack of oxygen to the baby’s brain around the time of birth – hypoxic ischemic encephalopathy (HIE) – is the biggest contributor to childhood epilepsy (seizures). Ngwende emphasizes that although hypoxic ischemic encephalopathy (HIE) is likely the most significant cause of seizures and epilepsy in children, there many other causes. One important cause is birth trauma, which can cause bleeding into the baby’s brain, which then often causes numerous problems in the child, such as cerebral palsy (CP) and epilepsy. Maternal infections that travel to the baby at birth can cause meningitis, which frequently causes seizure disorders. Early jaundice and abnormally high levels of bilirubin can cause kernicterus and other forms of brain damage, which can result in cerebral palsy and seizures in the child. Another condition that can cause permanent brain damage if untreated is prolonged low blood sugar (neonatal hypoglycemia), which can also cause childhood epilepsy. High bilirubin levels and neonatal hypoglycemia are very easy to diagnose and treat. What Are the Treatments for Hypoxic-Ischemic Encephalopathy and Seizures? HIE can be treated by cooling the baby’s brain to a few degrees below normal for 72 hours. This treatment is called hypothermia (brain cooling) treatment. The key with brain cooling therapy is that it must be given to the baby within 6 hours of the brain insult that caused the HIE. Thus, hypothermia treatment usually must be given within 6 hours of birth. Research shows that brain cooling treatment halts almost every injurious process that starts to occur when the brain suffers an oxygen-depriving insult. The treatment has been shown to not only save babies’ lives, but it can prevent babies from having cerebral palsy, or from having more severe forms of CP. Just like HIE must be immediately treated, so too should seizures. Seizures can injure the brain every time they occur, with the potential to cause the child to have permanent brain damage. Treatment of seizures first involves identifying and treating the underlying cause. Thus, for example, if a baby has high bilirubin levels (jaundice) or hypoglycemia, the bilirubin levels and blood sugar levels must be normalized. While the medical team is working on finding and treating the underlying cause of the seizures, seizure medication may need to be given right away, in most cases. If an underlying cause is found and treated, the seizure medication may be able to be stopped. Phenobarbital is the most frequently used initial drug for seizure activity that is epileptic in origin. What Are the Causes of Birth Asphyxia and Hypoxic-Ischemic Encephalopathy? Birth asphyxia occurs when a baby experiences a lack of oxygen in her brain during of near the time of delivery. Asphyxia can cause an injury in the baby’s brain called hypoxic ischemic encephalopathy (HIE). HIE is the most common cause of neonatal seizures. Birth asphyxia can be caused by anything that interferes with the oxygen-rich blood traveling from the mother to the baby. In the womb, the baby receives all her oxygen from blood traveling from the mother, through the uterus and placenta (uteroplacental circulation), and lastly through the umbilical vein and into the baby. Common problems that can cause birth asphyxia are umbilical cord, placenta and uterus (womb) complications, which can cause the baby to be partially or even completely cut off from her supply of oxygen-rich blood. Listed below are common causes of birth asphyxia. Hyperstimulation of the uterus caused by the labor induction drugs Pitocin, Cytotec and Cervidil. Placental abruption. This is where the sac that holds the baby – the placenta – separates from the wall of the uterus. This can result in severe bleeding and loss of oxygen to the baby. Umbilical cord prolapse. This is when the cord exits the birth canal in front of the baby, which often causes the cord to be compressed. Nuchal cord (cord wrapped around baby’s neck), a short umbilical cord and the cord in a true knot can all cause cord compression. Preeclampsia. This is when the mother has high blood pressure diagnosed during pregnancy, which can cause a decreased flow of blood to the baby. Stroke. This is when blood vessels in the baby’s brain become blocked or restricted. Forceps and vacuum extractors can cause the baby to have a stroke, which can cause severe oxygen deprivation. Hypoxic ischemic encephalopathy (HIE) and stroke often occur together. Oligohydramnios(low amniotic fluid). This is a condition in which the mother has low amniotic fluid. Oligohydramnios puts the baby at a significant risk of having a prolapsed or compressed umbilical cord. Oligohydramnios can also lead to meconium aspiration, which can cause respiratory distress and oxygenation problems. Delayed emergency C-section. Failure to quickly deliver the baby when oxygen deprivation (fetal distress) is evident on the heart rate monitor can cause birth asphyxia. What’s the Difference Between Seizures and Epilepsy? To define epilepsy, one must understand the concept of a seizure. A seizure is a sudden, abnormal, excessive electrical discharge from the cortex, which is the brain’s outer layer of tissue. A seizure is essentially like a short circuit in a complex electrical circuit that disrupts the normal functioning of the brain. Seizures do not always manifest as convulsions; they may manifest in other ways, such as blank stares and disorientation. In fact, newborn babies often have no outward signs of seizure activity. Epilepsy is defined as recurrent unprovoked seizures or a tendency towards repeated unprovoked seizures. As discussed earlier, oxygen deprivation around the time of birth (birth asphyxia) and HIE are the biggest contributors to childhood epilepsy. Birth asphyxia and HIE can cause cerebral palsy, and approximately 25 – 35% of children with cerebral palsy have epilepsy. Dr. Ngwende emphasizes that good prenatal care as well as good obstetrical care during delivery can help reduce the incidence of epilepsy. Seizures must be promptly diagnosed, and first line medications, such as phenobarbital, should be available at all hospitals. If you are seeking the help of a hypoxic ischemic encephalopathy (HIE) lawyer, it is very important to choose a lawyer and firm that focus solely on birth injury cases. Reiter & Walsh ABC Law Centers is a national birth injury law firm that has been helping children with birth injuries for almost 3 decades. 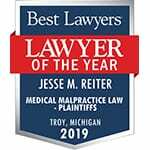 Attorney Jesse Reiter, president of ABC Law Centers, has been focusing solely on birth injury cases for over 28 years, and most of his cases involve hypoxic ischemic encephalopathy (HIE) and cerebral palsy. 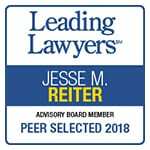 Partners Jesse Reiter and Rebecca Walsh are currently recognized as being two of the best medical malpractice lawyers in America by U.S. News and World Report, which also recognized ABC Law Centers as being one of the best medical malpractice firms in the nation. The hypoxic ischemic encephalopathy (HIE) lawyers at ABC Law Centers have won numerous awards for their advocacy of children and are members of the Birth Trauma Litigation Group (BTLG) and the Michigan Association for Justice (MAJ). If your child was diagnosed with a birth injury, such as cerebral palsy, periventricular leukomalacia (PVL), a motor disorder, developmental disabilities or hypoxic ischemic encephalopathy (HIE), the award-winning hypoxic ischemic encephalopathy (HIE) lawyers at ABC Law Centers can help. We have helped children throughout the country obtain compensation for lifelong treatment, therapy and a secure future, and we give personal attention to each child and family we represent. 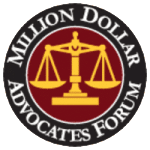 Our nationally recognized birth injury firm has numerous multi-million dollar verdicts and settlements that attest to our success and no fees are ever paid to our firm until we win your case. Email or call Reiter & Walsh ABC Law Centers at 888-419-2229 for a free case evaluation. Our firm’s award-winning hypoxic ischemic encephalopathy (HIE) lawyers are available 24 / 7 to speak with you. Watch a video of Michigan hypoxic ischemic encephalopathy (HIE) lawyers Jesse Reiter and Rebecca Walsh discussing how birth asphyxia can cause HIE, which often results in seizures. Most neonatal seizures are caused by hypoxic ischemic encephalopathy.